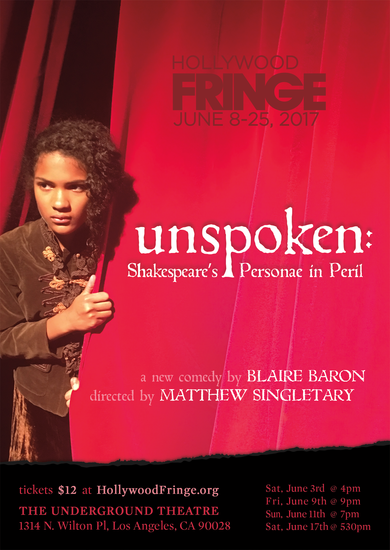 One of the 10 FRINGE Scholarship Selections, Unspoken: Shakespeare’s Personae in Peril – is the first in playwright, Blaire Baron’s “Spoken” Trilogy, of plays honoring many of the Bard’s “Unsung” characters. In this play, The Shakespeare Canon is about to be privatized. A group of minor Shakespeare Actor-Characters are held in a Greenroom while the new “Funders” vote on permanent cuts and modern adaptations to the Canon. They must stand before the Funders and fight for their relevance. 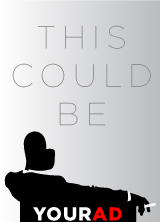 A bittersweet comedy, the noteworthy theme embraces all marginalized people and groups having to claim their right to exist in a rapidly intolerant society. Another layer of the play is the bittersweet life of actors, asking the question – are all the sacrifices made for a life in the theatre really worth it? The characters featured are from Romeo and Juliet, Merchant of Venice, A Midsummer Night’s Dream, Taming of the Shrew, and Hamlet. Appearances by Members from The Los Angeles Drama Club (Country’s Youngest Shakespeare Ensemble).